Eber Simpson attended West Point where he starred on the baseball and basketball teams. Simpson was a highly decorated pilot during WWII completing over 100 missions. After the war, he became an army test pilot. 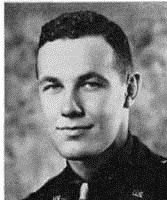 While flying home on leave in 1946, Simpson and five other soldiers were killed in the crash of an army plane. Simpson was 24 years old. Born: Dec 3, 1921 Died: Sep 20, 1946 Hometown: Eau Claire, Wi.